DESCRIPTION Table lamp available in 3 sizes, highlighted by a ribbed, hand-blown glass diffuser of white and crystal edges. The conical diffuser caps the design and the incandescent light source is great for task and accent illumination. Companion wall, ceiling, pendant, floor and other table designs are also available. CONSTRUCTION A painted titanium, circular base supports the ribbed glass diffuser. 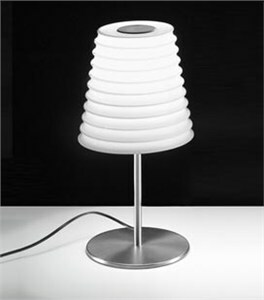 An on/off switch is located on the black cord which exits the stem of the table lamp.